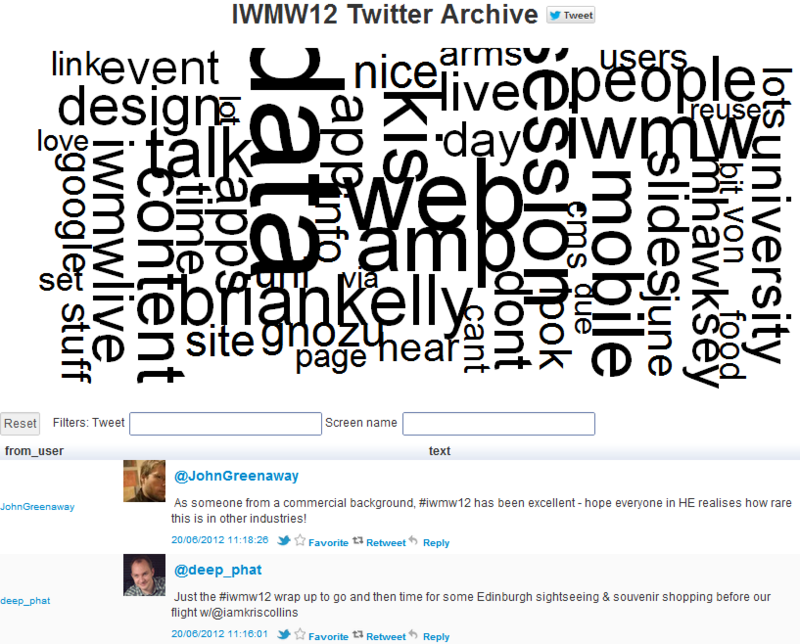 « Twitter Analysis: Can #bathopenday Learn from #IWMW12? IWMW 2012 Is Over: Long Live IWMW 2012! “Conferences don’t end at the end anymore” tweeted @markpower two days after IWMW 2012 delegates had left Edinburgh and returned home. This has always been the case: conferences organisers will have evaluation forms to analyse and invoices to chase. But the point Mark was making related to the continuing discussions about the ideas discussed at an event and the accompanying resources, resources which increasingly these days may have been created during the event and support for the participants, which can help to ensure that an event is not just an collection of individuals who are co-located for a few days but, as I described in a recent post, a sustainable and thriving community of practice. A related point was made recently in a post on “#mLearnCon 2012 Backchannel – Curated Resources” in which David Kelly described how “The backchannel is an excellent resource for learning from a conference or event that you are unable to attend in-person” and went on to add that he finds “collecting and reviewing backchannel resources to be a valuable learning experience …, even when [he is] attending a conference in person. Sharing these collections on this blog has shown that others find value in the collections as well.” But what are the resources from the IWMW 2012 which may be of interest to others, where can they be found and what value may they provide? The slides used by the plenary speakers were uploaded to Slideshare in advance of the talks in order to allow the slides to be embedded in relevant Web pages and enable a remote audience to view the slides. It should also be added that this also allowed participants at the event to view the slides if they were not able to view the main display of the slides. 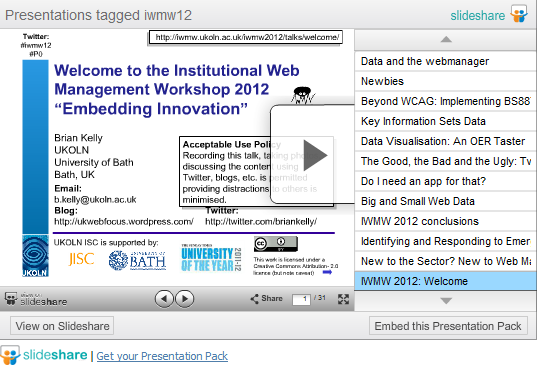 The slides have been tagged with the “iwmw12” tag on Slideshare. This enables the collection of slides to be accessed by a search for this string or by browsing slideshows which use this tag. Note that in previous years an event tag had been used, but this service was discontinued recently, after Slideshare had been bought by LinkedIn. Creating a collection of slides used at the event enables a Slideshare presentation pack to be created, as illustrated, thus making it easy to access all slides used at the event which have been made available. As can be seen from the IWMW 2012 web site, the presentation pack can be embedded in Web pages. This service is being used since participants at IWMW have frequently asked to be able to access slides, including slides used in parallel sessions which they were not able to attend. Using Slideshare makes it easy to respond to this user need. In addition it helps to raise the profile and visibility of speakers at the event. 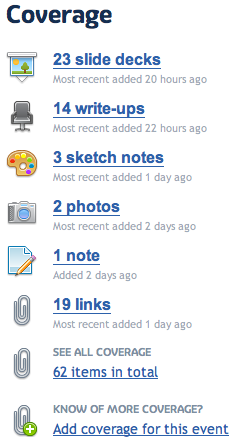 This can help to spot if inappropriate entries are being added. 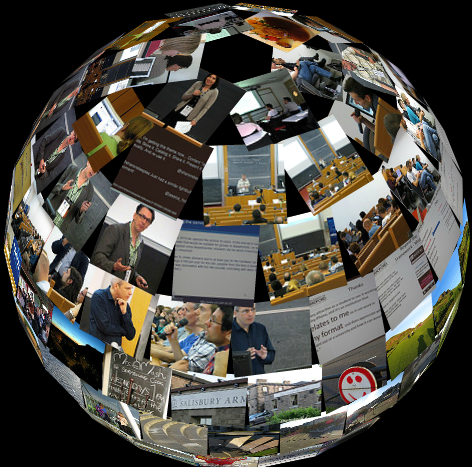 As described in a post on Streaming of IWMW 2012 Plenary Talks – But Who Pays? we used the ustream.tv service for the live video stream. The videos are currently being processed and will be made available via UKOLN’s Vimeo account shortly. This service will be used to wider access to the plenary talks so that they are available for those who were not present at the event – although, of course, they can also be viewed by people who were at the event and wish to watch the talks again. In addition to the video recordings of the talks we have also taken a number of short interviews with participants at the event which will enable their thoughts on the event to be shared with a wider audience. With so many delegates now having digital cameras and smartphones there are a large number of photographs which have been uploaded to Flickr with the IWMW12 tag which can help to provide a collective memory of the event. Having a large number of photographs, rather than a small set of selected ones taken by an official photographer, provides a much broader perspective on the event. It also means that images browsing interface services, such as Tag Galaxy, are more useful by having a more diverse range of content. The two images show a display of a Tag Galaxy search for photographs on Flickr with the “iwmw12” tag and one of the many photographs taken by Sharon Steeples of the final conclusions session during which I showed an image of the video stream, captured earlier that morning when Dawn Ellis gave a summary of Web developments at the University of Edinburgh, subverting normal conference-style approaches to case studies by telling this as a fairy tale. The video recording of this talk will be particularly worth watching. 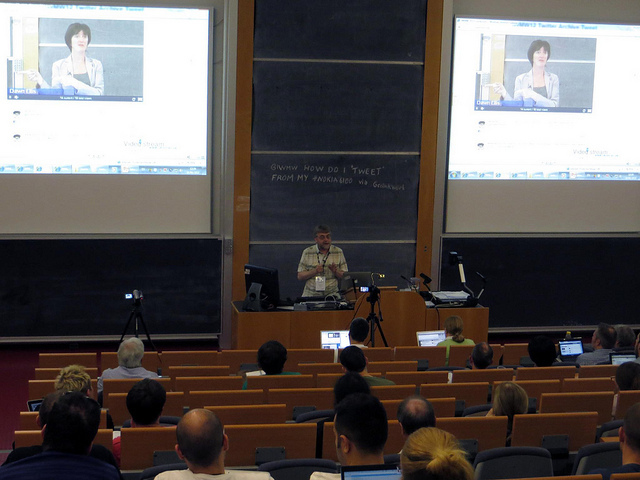 As can be seen from the image shown above, the lecture theatre also has a large blackboard. The opportunity to use a blackboard during the final session provided too much temptation to ignore – so in the summing up a tweet posted on the backboard was displayed, as a reminder that not everyone necessarily has a mobile device they could use for tweeting. However many people did use Twitter during the event. As is widely known, content posted on the Twitter stream becomes unavailable available a short period. There is therefore a need to analyse event tweets shortly after an event – or archive the tweets to allow them to be analysed subsequently. As can be seen from the image of the Topsy search for #IWMW12 tweets posted over a period of the past 7 days (click for a larger display) there were 666 mentions on 18 June and 574 on 19 June. 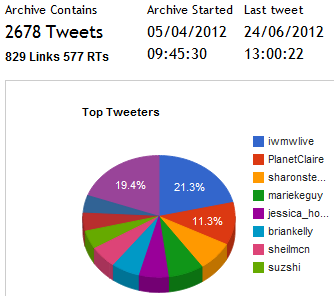 The most highly tweeted link was to the IWMW 2012 video page, which was mentioned in 43 tweetsduring the week on 17-24 June 2012. In total Topsy reported that there were 748 tweets during the week on 17-24 June 2012, 808 in the month from 24 May-24 June and an overall total of 846 tweets to date. It should be noted that a large number of Twitter analytics tools are available which be used to analyse how Twitter has been used. The Tweetreach service, for example, reports that tweets containing the #iwmw12 hashtag have reached 7,553 Twitter accounts. However, as is often the case with usage statistics, such figures need to be treated with a pinch of salt. Topsy, Tweetreach and other Twitter analytics tools can provide a useful summary of use of Twitter hashtags. However in the UK higher education development community we are fortunate to have the expertise of developers such as Martin Hawksey and Tony Hirst who have a well-established track record in the development of value Twitter analysis tools and who can continually develop their tools based on particular needs and interests of the community. As Martin described in a post entitled IWMW12 Data Hacks for the IWMW 2012 event he was “collecting an archive of tweets which already gives you the TAGSExplorer view“. Looking at Martin’s Twitter archive of #iwmw12 tweets, provided by the TAGS v.40 service, we can see that the top five Twitterers were @iwmwlive (281 tweets), @PlanetClaire (149 tweets), @sharonsteeples (103 tweets), @mariekeguy (100 tweets) and @jessica_hobbs (81 tweets). Since the @iwmwlive Twitter account was managed by Kirsty Pitkin it seems that the top twitters at the event were all female: this seems particularly interesting in light of the fact that only about a quarter of the participants were female. It should also be noted that this tool also provides a display of the tweets over time. 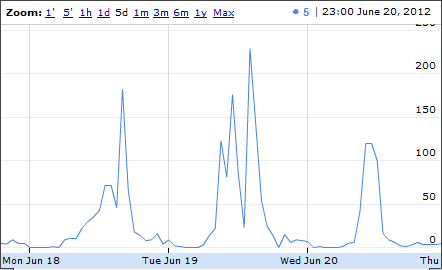 It can also be seen (right) that tweeting peaked at 2pm on Tuesday, 19 June 2012 with 229 tweets. As someone from a commercial background, #iwmw12 has been excellent – hope everyone in HE realises how rare this is in other industries! Further examples of tools which Martin Hawksey developed at the IWMW 2012 event can be accessed from his Delicious IWMW12 Hacks set of bookmarks. Finally I should mentioned the IWMW12 paper.li daily newspaper, which had been set up in advance of the event. This automated newspaper consisted of articles based on links which had been tweeted containing the event hashtag. Conferences have never ended immediately after the final talk has been given – this is always the paperwork to be processed, the evaluation forms to be analysed and feedback given to the speakers and local event organisers. What is different nowadays is that event resources and discussions are no longer ‘trapped in space and time’. If an event has value, it should surely have value for those who may not have been able to attend. 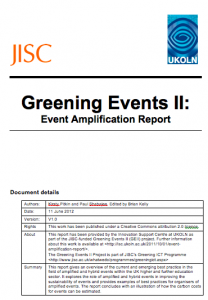 It was therefore appropriate that during my opening talk I was able to announce the launch of the JISC-funded Greening Events II; Event Amplification report. We hope that the report will be useful for others who are planning amplified events. As Mark Power put it: “Conferences don’t end at the end anymore” – you need to make plans for managing the resources after the conference is over. We hope the report will be useful for those planning amplified events. NOTE: Shortly after this post was published a post entitled “But who is going to read 12,000 tweets? !” How researchers can collect and share relevant social media content at conferences was posted on the LSE Impact of Social Sciences blog which echoed the approaches described in this post. This entry was posted on 25 Jun 2012 at 9:00 am	and is filed under Events, Evidence, preservation, Twitter, Web2.0. You can follow any responses to this entry through the RSS 2.0 feed. You can leave a response, or trackback from your own site.